It’s been a long while since I’ve felt that, or heard it. Being part of the New England Spahtens means I’m usually surrounded with people who have gotten comfortable being uncomfortable, and OCRs don’t scare them. We’ve been at it a while! 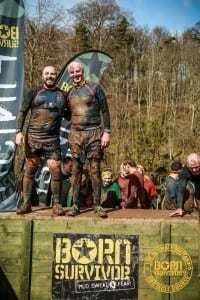 My first OCR was 2010, and I’ve run many, from small 5ks, to 1/2 marathon Beasts since then – but this was the first time I ran an event outside North America – my father and I ran the 2015 Born Survivor, held in the Lake District region of the UK. 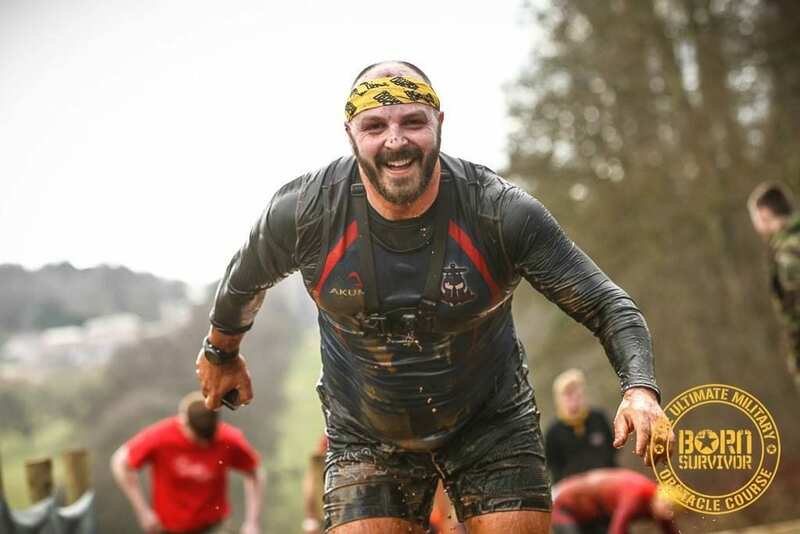 A 10k, military inspired and supported race over rolling fields, through rivers and across some amazing countryside. The venue, Lowther Castle was easy to find, and only a couple of hours away from my family, where we were staying. Pre race communications were excellent, although the race closed it’s registration almost two weeks before the date, which I found a little unusual. Parking was five pounds, in a huge field right next to the race venue, very easy to access and go back and forth – but gave us a taste of the mud we’d soon get familiar with. As we walked down the hill from the parking lot to the race festival, it was clear these guys were well organized – one of the fastest registration experiences I’ve had in a long time, race day bag check (and pre-paid bag check totally separate lines) and bathrooms had a bit of a line, which is typical. Separate tents for male and female changing, and a pretty nice festival area, with vendors of beers, some food trucks, ice cream, the Born Survivor tent selling swag, and some other vendors of shoes, race day gear and such. One standout thing – they had some amazing spectator access – almost everything was open access to family and friends – with great maps handed out and several of the finishing obstacles right there, including spectator favorite, The Blitz (an Everest style quarter pipe). 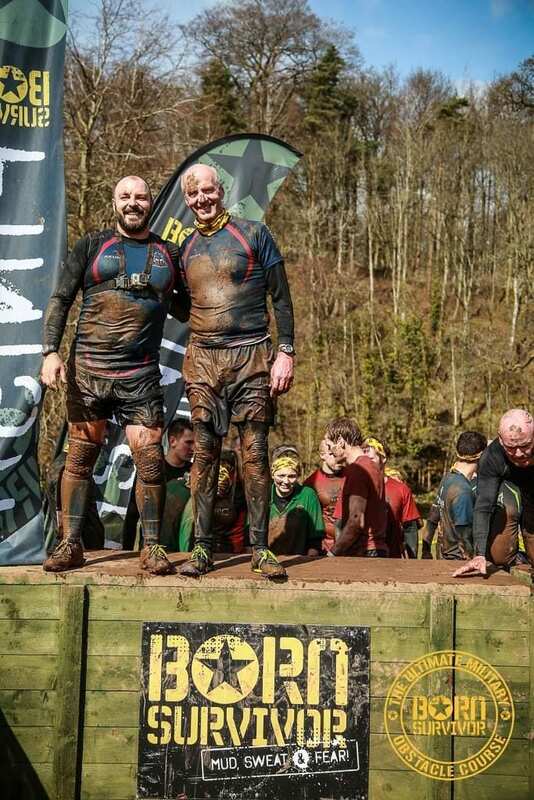 This was definitely a race you could bring your family and friends out to! Our 11:20 heat started on time, with a warmup from the army and we were off onto the green fields. Disclaimer – I never remember the order we did obstacles in, and don’t try to – the course will never be the same layout anyway. Everything out there was well built. 10’ walls that didn’t move when you hit them, to even taller A frame walls (without rope – team work needed!) that were planted. They have three slip and slide’s in a row – and the tarps were unripped and looked almost new. Barbed wire crawls were real wire, but not especially low – and their use of river crossings was excellent – with knee to waist deep waters, and thick, solid plastic wrapped wire cable for you to hang on too, if you needed. Safety was a clear and present concern, and I want to commend them for doing something I’ve seen at no other race this past five years. The terrain was slick – not especially challenging if you had proper footwear, but a high portion of people were in old road sneakers, and clearly slick mud, and flat tread were taking their toll on ankles. At one point, we came to an obstacle, and the volunteer – there was a radio’d volunteer at every one of the 39 obstacles, stopped us. The race was on hold – they were stopping everyone at every obstacle. Why? The high number of rolled ankles meant they had no medics available to respond to problems. Race hold until the medics were able to recover everyone from the course, and be available again. They knew that if someone had an injury at that moment in time – with all medics off in land rovers or on course – they couldn’t respond. It meant a 15 minute window where we had to hold – but no backlogs would happen – everyone stopped at their next obstacle along, no course cutting. Once we had the all clear, it was like nothing had happened – by the time we hit the next obstacle along, things were flowing perfectly again – huge props to Born Survivor organizers for that one. The water safety was also top notch, with fully suited rescue guys at every river crossing, in or near the water. Obstacle style was a varied mix – some fear style obstacles – narrow tunnel crawls, a few water traverses and a quick dunk underwater – along with several easy, flowing things – small walls, some log ladders, balance beams and a teeter totter screwing up those with poor footwear – then, some real challenges – a 10’ wall with no rope or kicker (even, an 11’ option! ), and an even larger A frame wall, again – no ropes or kicker – both of which required team work to get over – surprisingly tough, after dealing with a series of smaller, easier obstacles the final obstacle, The Blitz (an everest style 1/4 pipe), was well built and getting slick by the end of the day. They had some things I hadn’t seen before too – “The Coffins” was a large “box” with three floors or levels, that you crawled into at ground level, then had to pop up to a middle level, and back to the first wall, before popping up and out on the roof – tricky for the bigger guys and potentially claustrophobic. The Killer K – while not an obstacle in and of itself, was a nice 1k section that had you go up and down a steep hill, navigating ten obstacles – from uphill wire crawls, log carries, high steps – it was also a fantastic spectator spot, with lots of people cheering – along with the later series of slip and slides (three of them in a row! being surrounded by people cheering you on, this was probably one of the most fun courses I’ve come across, for spectators. I really enjoyed the water crossings, and the mix of crawls – some deep in mud, others on soft grass to keep things mixed up. What could they do better? There were some things I missed – medals at the finish line being one. I gather they used to do dog tags, which would have been fine too, but instead I came away with a shirt (plastic wrapped! ), silicon wrist band, some temp tattoos and samples. Good, but not great. 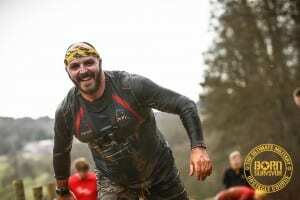 For some reason, they didn’t have showers either – this was communicated before hand, but the race was significantly muddy, and the streams nearby in use for racing, so not a good option to take a quick dip in to clean up. On the course, the teeter totters were *significantly* slippery, and I saw more than a few bad spills there – no problem in studded icebugs – major problems in road running shoes wrapped in duck tape. The slip and slides ended with the tarp going straight onto the grass – something I’ve avoided ever since Superhero Scramble put one on the side of the hill in Amesbury MA in 2013, and all the kicked up rocks and gravel turned it into a cheese grater – I’ll never do a slip and slide that doesn’t end in a pool again – no one seemed to be having any major problems, other than a few people getting wiped out as they tried to get off though. A couple of spots with backlogs where a simple solution of building the obstacle double wide, or digging a couple more tunnels – would have significantly eased things up, but never anything too terrible. 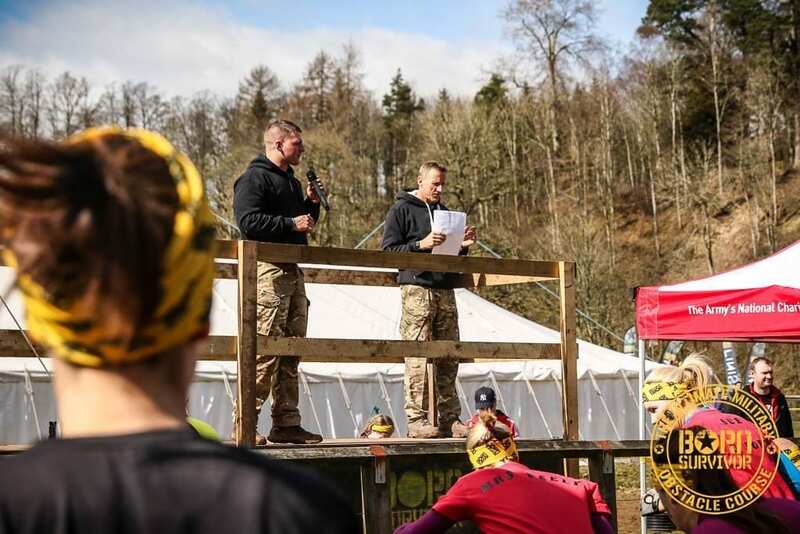 Born Survivor was a challenging distance, and while not a significantly difficult course, it had lots to offer, and was big on the fun – incredibly well organized and managed, it was clear that there is a professional team putting this show on. There’s another Born Survivor in Manchester, England in September. Check it out.